As A Sale Is A Love Affair blows out the four proverbial candles on the birthday cake, its sibling, The Persuasion Paradox, is being conceived. Little did I know that in the month of Love Affair’s launch four years ago, the book would become the Number 1 New Release on Amazon. It was the perfect day for a book launch… by today’s standards, anyway. No. It wasn’t a Thursday evening in a Manhattan book store. It wasn’t the first morning at an industry conference. This was a snowy Sunday morning. This was a morning for staying home in both Central Europe and the Northeast U.S., my sweet spots for online connections and personal brand. It was the 1st of February, the month of love, and the launch was online. On this stay-in-your-pyjamas-and-have-a-second-cup-of-coffee Sunday morning, the clicks were happening almost by the minute on Amazon. With a lot of planning and a bit of luck, A Sale Is A Love Affair was off to a flying start. 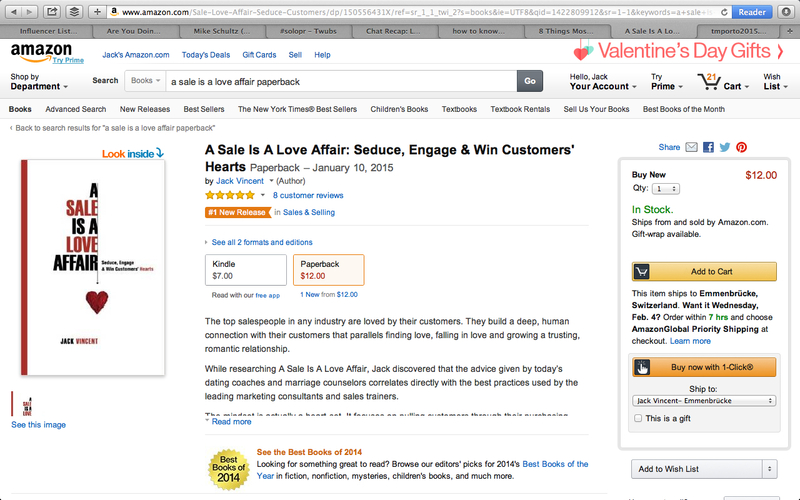 Amazon would rank Love Affair as the Number 1 New Release in Sales for that month. I kind of knew that a successful book would lead to speaking engagements, but I wasn’t quite ready for that first year. I absolutely did not know that, three years later, a serious accident would only amplify the sales-love duality in my already-obsessed heart and mind, in the form of persuasion. Dualism. The Sales-Love parallel morphed into my next book, The Persuasion Paradox. Love. Sales. Yin. Yang. Dualism. I could have been killed. But I grew. As some of you know, I was hit by a car in a crosswalk last winter. It was a traumatic moment. OK, it was surreal. Going into surgery the following morning, it wasn’t clear how much movement I’d have in my left shoulder and arm. Coming out of the surgery four-and-a-half hours later, things looked much better. Oh, it could have turned out so much worse, not just for the outlook on my shoulder, but for the outlook on my life. For the rest of the winter, I went into full recovery mode… and full introvert mode. Yeah, me, the extrovert, in full Yin introvert mode. I had long been a student of the Yin Yang. As I see it, Yin Yang rules the world. And now Yin was running my show. Seven years earlier I’d had my Summer of Sin. This was to be my Winter of Wisdom. Discovery. Inner exploration. Deep Dive. As I see it, the Yin side of creativity. By spring, the sun was waxing, and I was on the stage again, as Main Stage host at the START Summit at the University of St. Gallen. Yang, the extrovert, was back, and the creative output was about to burst. I had prepared for my conference opening, of course, but backstage, 20 minutes before going live, something hit me. I threw out my conference opening., and then, Lights! Cameras! Action! I took the stage and told my story… that in the wake of the accident I realized, perhaps the hard way, that life is not a dress rehearsal. “So let’s not waste it on the meaningless, or on what we’ll never get done,” I told the audience, “or on what will never be valuable to the universe. “Personally, I won’t climb Mt. Everest. I won’t swim the English Channel. I won’t do a lot of things in what’s left of this lifetime. But I will do a few important things. “Between now and my next accident, between now and my last breath, I have two things to bring to the world: love… and value. “If you think about it, they’re the same thing. “You, each of you, have great things to bring to the world, too. So, bring it. Now. There. I had given something away. And the value came back to me. Exponentially. For the rest of the two-day conference, students, thought leaders, startup CEOs, all sorts of inspired and inspiring people approached me, and we kicked around the concepts of love, value, creativity, focus. The seed was planted and, within a year, it would sprout. Later in the year, the Eureka! Moment would hit me. The Persuasion Paradox. By giving something away, the value came back, exponentially. Once again, the timeless truth: the more you give, the more you get. And that… is the ultimate paradox. I help companies sell more effectively. I created the S.C.O.R.E© Selling Method – Five Key Steps to Selling More Effectively, which can be adapted to fit your selling process and, as importantly, your prospects’ purchasing process. If you want to sell more effectively in five key steps, email me at jack@jackvincent.com or give me a call at +41 76 43 43 043.